No matter what brings you to Tybee Island, there are unique experiences that await. From sunrise to sunset, we’ve compiled a complete bucket list for those who want to see everything Tybee Island has to offer. Tybee Island is perfectly positioned for stunning sunrises every morning. Skip sleeping in and set your alarm for an early wake up call. Grab a latte to-go from Tybean Art & Coffee Bar, then make your way to the Tybee Island Pier and Pavilion for an optimum sunrise experience. If adventure is calling your name, enlist the help of Sea Kayak Georgia to reach the Cockspur Island Lighthouse. Located at the south channel of the Savannah River by Lazaretto Creek, this tiny lighthouse is considered part of Fort Pulaski National Monument. Although visitors are not able to climb the lighthouse, the views from the waters surrounding it make for some incredible photos! Seafood is a staple on menus across Tybee Island. From oysters and shrimp to crab and fish, there’s no shortage of delicious seafood locally caught in the waters around our barrier island. One restaurant serves seafood so fresh, that you can watch the fishermen come back from the docks right from your bar stool. Bubba Gumbo’s is a purveyor of great seafood served at Tybee Island Marina. Take our word for it, you won’t be disappointed when you order the special of the day. After a day full of sunbathing and splashing in the Atlantic Ocean, there’s nothing better than kicking back with a cold libation while you listen to live music. Grab a table on the outdoor deck of North Beach Bar & Grill where this friendly neighborhood eatery offers live music on their casual patio. Interested in watching the sunset as you kick back to some tunes? Make your way to A-J’s Dockside Restaurant. The deck at this marshside restaurant serves up some of the best views in town providing the perfect backdrop to the live music line-up. Many visitors to Tybee Island are unaware that just south of our bustling beach town lies an uninhabited nature preserve called Little Tybee Island. 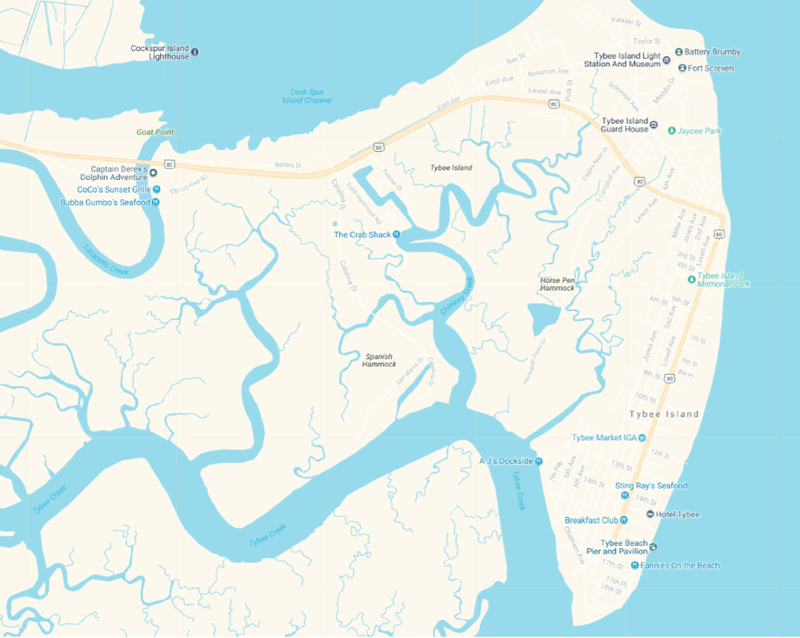 This hidden treasure is actually twice the size of Tybee Island and only accessible by boat! So, rent a boat or hop on a tour, and spend the afternoon exploring this island paradise. A Tybee Island bucket list would not be complete without a visit to the Tybee Island Lighthouse! Known as one of the quintessential sights on Tybee Island, this historic beacon is a great attraction to climb, explore and learn all about the island’s history. Driving around Tybee Island you might notice a few TYB bumper stickers on vehicles and wonder where you can snag your very own island keepsake. South Beach offers a variety of shops like T.S. Chu Department Store, where you can find unique souvenirs and essential beach gear. Those looking for locally-made art and home furnishings should check out The Shoppes at 1207, located near the Tybee Oaks Shopping District. Just make sure you saved enough space in your suitcase! Spend the afternoon making new friends and learning about Tybee Island’s coastal creatures. Hop aboard Captain Mike’s Dolphin Tour or Captain Derek’s Dolphin Adventure for a tour you won’t soon forget! Bottlenose dolphins can be found in the waters surrounding North Beach and visitors are guaranteed to spot these amazing creatures in their natural habitat. For those looking to stay on dry land, Tybee Island Marine Science Center is located on South Beach where visitors can walk through unique exhibits, listen to guest speakers and even meet our resident sea turtle – Admiral! History buffs and nature lovers should make their way to Fort Pulaski National Monument. This historic structure has stood the test of time and ranked as one of the “most spectacular harbor defense structures” in the United States during the Civil War era. With several nature trails surrounding the monument, visitors have plenty of ways to stay active while learning about its unique history. Featuring some of the best views on the island, Tybee’s Back River Beach offers stunning sunset views. Whether you snuggle up on a beach blanket, splash around on the shore or take a walk on the Back River Fishing Pier, you’ll have a front row view to one of our most treasured island experiences. We don’t think there is a better way to end a day on Tybee Island. If you check all of these off your Tybee Island bucket list, rest easy knowing that you’ve had some of the most unique experiences only found on our coastal island. From sunrise to sunset, there is plenty to see and do while visiting Tybee Island!